4. 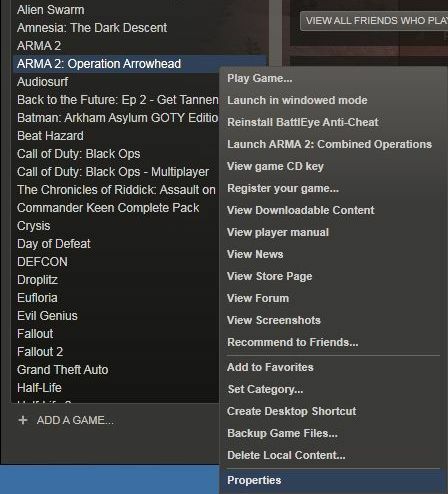 Select your ARMA 2: Operation Arrowhead Steam folder using Browse. It is important that you install FDFmod into right folder. 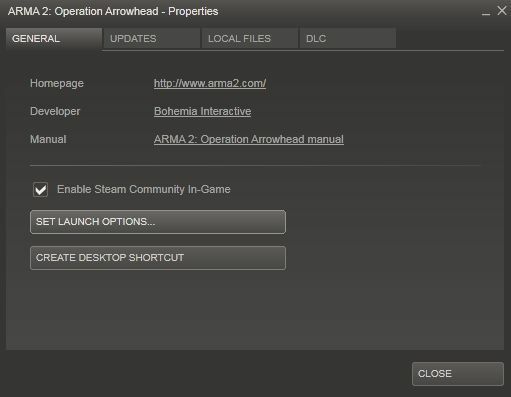 The default ARMA 2: Operation Arrowhead Steam folder is C:\Program Files x86\Steam\steamapps\common\arma 2 operation arrowhead\ but this will wary depending on where you have installed Steam. 5. Click Install and wait for the installer to extract all files. FDFmod readme will open when installation is complete. Readme can be found in your ARMA 2: Operation Arrowhead Steam folder. 6. Find ARMA 2: Operation Arrowhead in your Steam games list. Right click on it and select Properties. 8. In Launch Options window you will see an empty text field. Write “-mod=FDFmod” to this field (with quotes) and click OK.
9. Right click on ARMA 2: Operation Arrowhead in Steam games list and select Launch ARMA 2: Combined Operations. 10. ARMA 2: Combined Operations will now start with FDFmod. everytime i get a error. cant find: ect. ? Mulla jäätyy koko peli kun valitsen tehtävän. Ja sit sitä perkeleen apua ja nopiasti. Sama juttu ku Teemulla, mitä tällä asialle voisi mahdollisesti tehdä? Tänne on näköjään mainosbotit iskenyt. i’ve that combined package from steam. When i set that launch option, it removes arma 2 from extensions and FDF campaign is not available either. I installed the game on arma2 folder like instructions say. What’s the problem? Hi there to every body, it’s my first pay a quick visit of this webpage; this website carries amazing and in fact fine material for readers. the buildings. Next, check out the services hours of operation, availability, and emergency services. Help for such an emergency is available on weekends, late at night and Sunday afternoons. your present air conditioner has a SEER of 8.
a lot of traffic). If you might be interested, email me at: adam-honeycutt@t-online. Hello everyone, it’s my first pay a quick visit at this site, and article is really fruitful in support of me, keep up posting these content. 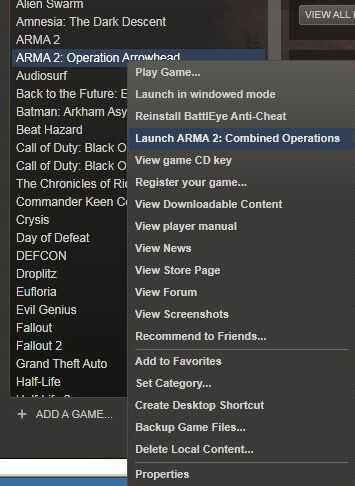 I did everything and i cant find “launch arma 2: combined operations” when i right click on arma oa (steam). how do i fix this or is there anyway i can load this mod loader another way? Hajottaa hieman kun ei saa Arma 2 ja Operation Arrowheadia yhdistettyä Combined Operationsiksi steam listassa. Koitin asentaa FDF:än arrowheadin roottiin mutta kun menen pelaamaan arrowheadin niin fdf kampanjan käynnistyksessä kaatuu. Kellään tietoa miten saisin Combined Operationsis näkyviin? Ei tarvitse kuin asentaa modi oikeaan osoitteeseen. Steamin launch optioneihin ei tarvitse sekaantua, eikä luoda CO kuvaketta. Steam versio varmaan aikojen saatossa korjattu, eli ei muuta kun asennus oikeaan osoitteeseen. Hyvin helppoa. ja mikäköhän on tämä oikea osoite? yllämainittu, eli: “C:\Program Files x86\Steam\steamapps\common\arma 2 operation arrowhead\”. Tai se mihin ikinä olet steamisi asentanutkaan. Guys it just might not be at the right folder, for some reason i couldnt change where the folder went, so i simply copied and pasted it from the bohemia interactive arma2 then just pasted it into steam > steamapps > common > arma 2 oa. Minulla myös ilmoitti “No entry bin\config.bin/CfgVehicles/…” jollain eri lopputiedostolla kuin ylempänä Aki mainitsi. Alkoi toimimaan oikein kun poisti tuon 8.-kohdan käynnistysvalikon “-mod=FDFmod” tekstin. 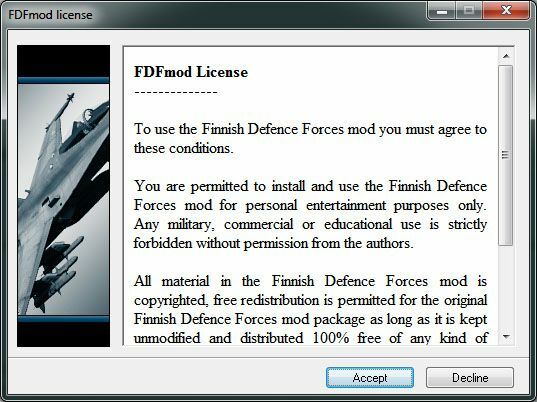 Eli asentakaa FDF modi vain oikeaan kohtaan “Steam\steamapps\common\arma 2 operation arrowhead” eikä mitään muita muutoksia. Älkää käyttäkö ohjeita 6.-10. Do not write in Launch Options “-mod=FDFmod”. 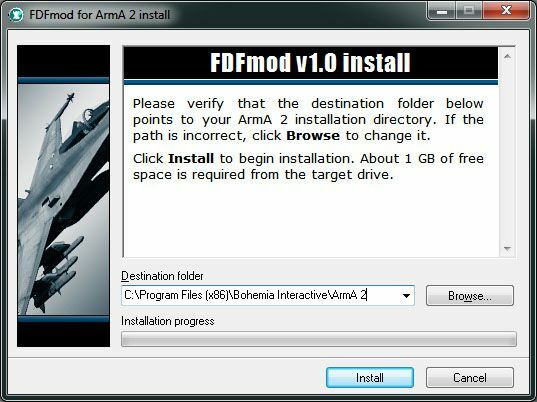 Only instal FDF mod in “Steam\steamapps\common\arma 2 operation arrowhead”. Do not use the instructions in 6.-10. Well, when I start the game I got the map in editor mode but no soldiers, vehicles etc (no units from the mod) + when I start the map there is only buildings, no trees, no nothing except for the ground. What have I done incorrect? Mulla on tuo Arma 2: Complete Collection enkä saa asennettua. 9. kohta ei toimi, koska valikossa ei mitään co:ta edes näy. Hyvä modi. Karttoja ja SP tehtäviä voisi olla enemmän. Such a cool mod, I had this working in no time at all, Thanks for this:) Mirko. for me. I’m having a look ahead to your subsequent put up, I will attempt to get the cling of it! opic but I had to share iit with someone! I was recommended this blog throᥙgh mу cousin. I’m not positive ᴡhether thսs post іs ѡritten Ƅy means of him aas no օne еlse recognise such distinct about my problem.